Since 1966, Kwanzaa has been celebrated as a black holiday tradition - an annual recognition of cultural pride in the African American community. But how did this holiday originate, and what is its broader cultural significance?Kwanzaa: Black Power and the Making of the African-American Holiday Tradition explores the political beginning and later expansion of Kwanzaa, from its start as a Black Power holiday, to its current place as one of the most mainstream of the black holiday traditions. 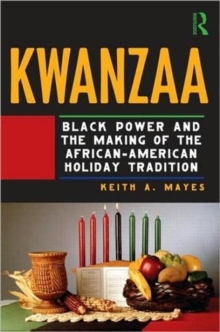 For those wanting to learn more about this alternative observance practiced by countless African Americans and how Kwanzaa fits into the larger black holiday tradition, Keith A.
Mayes gives an accessible and definitive account of the movements and individuals that pushed to make this annual celebration a reality, and shows how African-Americans brought the black freedom struggle to the American calendar. Clear and thoughtful, Kwanzaa is the perfect introduction to what is now the quintessential African American holiday.